In cultures all over the world, the figure of the shaman stands out as the one who bridges the mortal and spirit worlds. Often living at the edges of society but functioning at its center, shamans were entrusted with the ability to communicate with nature spirits, ancestors or a culture’s gods and goddesses — and could function variously as oracle, doctor, psychotherapist and beyond. Such practices have ancient roots, but — as artist and Jorge Mañes Rubio discovered — shamanic traditions are still very much alive and relevant today. Here, Mañes Rubio, a TED Fellow, describes what he experienced when he entered the world of contemporary Korean shamanism during a 2017 residency at Seoul’s National Museum of Modern and Contemporary Art, and offers his take on how it relates to humanity’s relationship to art and spirituality. Manshin Kim Keum-Hwa performs at her shrine in Ganghwa Island, South Korea. 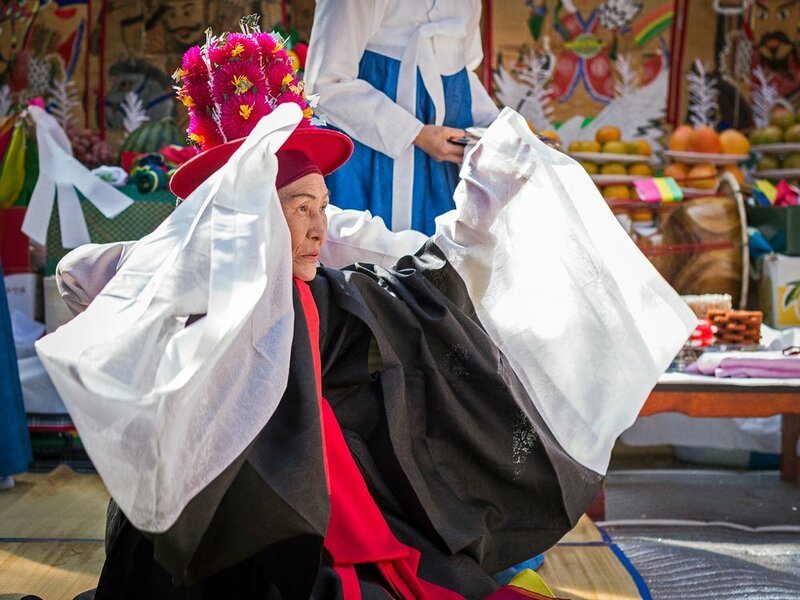 Kim Keum-Hwa is a famous shaman, designated by the South Korean government as an “Intangible Cultural Treasure.” This three-day ritual was held to celebrate her 70th anniversary as a shaman. What did you understand shamanism to be before you went to Korea? How did that compare to what you actually found? My idea of shamanism going into this project was very much a Western perspective: I thought a shaman would live in a remote place, maybe a jungle in Brazil, or in West Africa. I also associated shamans with people who ingest substances to send their souls into other worlds to retrieve knowledge. Korean shamanism works the opposite way. The spirit of the shaman—known in Korea as manshin—does not travel somewhere else. Instead gods, spirits or ancestors descend into the shaman, so that the shaman becomes a god herself. It’s a very powerful thing to witness: the possessed shaman talks and moves completely differently, she presents completely different personalities — sometimes speaking in regional dialects that the shaman herself does not know how to speak — and assumes a position of authority. People acknowledge the god’s presence with particular hand gestures and a bow — this means you recognize that the shaman’s not a shaman anymore, she’s a god. A Chinese Envoy of Death God appears at a shamanic ritual in a dedicated ritual space called a gutdang, near Kookmin University, Seoul. This particular female god enjoys heavy drinking and smoking, demanding to be pleased in order to placate her anger. The ritual was carried out by manshin Kim Nam-Sum. Why do people go to shamans? You can consult a shaman for any reason — whether moving to a new house, buying a new car, to help your business, to make sense of your son or daughter, or something heavier. If a person is going through a particularly bad illness, for example, a shaman might conclude that an evil spirit or restless ancestor is interfering and an exorcism is needed. I never witnessed an exorcism, but I did see, for example, a ritual organized for the parents of a client who was worried that they weren’t happy at the end of their lives. When it comes to health issues, a shaman may confer a healing, but will not claim to be a substitute for Western medicine. If someone is very sick, and the shaman sees it, she will do a ritual but urge the person to visit a hospital, perhaps acting as an oracle and recommending a time or particular establishment. Where do Korea’s shamans operate? Are there temples? Do they mainly practice in remote areas, as you thought? My prejudices told me that shamanism and urbanism don’t really go together, but I learned that in Korea, they definitely do. 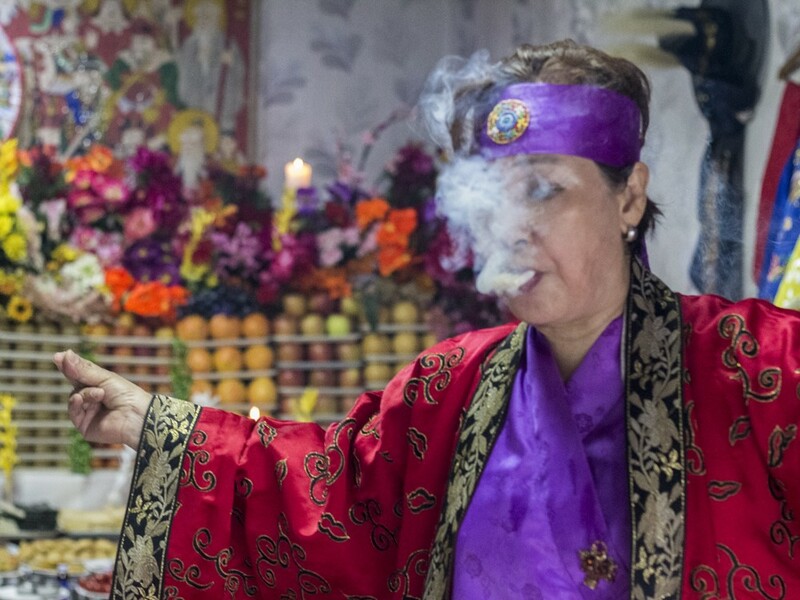 Seoul has Korea’s biggest concentration of shamans. It used to be a rural practice, and of course there are different styles spread all over Korea — including North Korea — but the shamans go where the clients are. For example, once a fire broke out in the middle of some new construction at the National Museum of Modern and Contemporary Art, so before continuing, they called shaman Kim Keum-Hwa to cleanse the place, to ensure the rest of construction would go well. So while people might hold prejudice towards shamanic practice, the truth is that shamans are still relied upon in 21st-century Seoul to play a role in society. There are shamanic temples dotted around Seoul — maybe one or two. But most of the time, they operate out of commercial temples called gutdang. A shaman will rent a room for the day, and customers meet her there to carry out the ritual. There could be five rituals going at the same time in this building. What does a typical ritual look like? Rituals are collective endeavors that link shaman, client and the spirit world. Each shaman typically acts out of their own space, which is decorated with statues of gods. It’s a bit like a doctor’s office. Often people make short visits, using the shaman occasionally as a fortune-telling consultancy. Only when the shaman diagnoses a more serious problem does she embark on a longer, more elaborate ritual. A full ritual is the very last resort for solving any problem. A whole team helps the shaman perform her ritual. They’ll play musical instruments key to helping the shaman make contact with the supernatural world — the most important being the hourglass drum and cymbal, but also gongs, rattle bells and flutes. Different sounds accompany the shaman throughout the ritual: loud, upbeat entrancing rhythms feature in the most dramatic moments, which can last for several minutes. Spirit daughters form part of the team: they’re young apprentices who are being trained and are learning the chants and different segments of a ritual. Depending on the importance of the ritual and the gods being summoned, several offerings are made: usually fruits, rice cakes, dried fish and alcoholic drinks such as soju and makgeolli. On very special occasions, even entire pigs and cows are offered. Shamans also use knives to assert their authority and power, stepping on their sharp blades at the end of a ritual. The shaman sharpens the blades right in front of you, and she’ll cut some clothes or vegetables to prove how sharp they are. The shaman will step and even jump on them for several minutes, but she won’t bleed or get hurt. It’s unbelievable unless you see it. Manshin Min Hye-Gyeong carries out a public ritual at Namhansanseong Mountain near Seoul. She represents a younger generation of shamans who make good use of social media and other digital platforms. It is. Once I witnessed a shaman—actually the sweetest, most beautiful and kind lady—get possessed by a terrifying god. Suddenly she was brandishing knives, shouting and demanding that all of us should bow to him—including me. I wasn’t sure what to do, but everyone looked at me as if to say, “Dude, you’re part of this now! Bow like everyone else!” So I did. How do the gods interact with the supplicant? The supplicant then says, “I’ll do better. I’ll get you a better costume; I’ll pray more for you. I’m going to bring you more wine.” In the end, the god finally agrees to help the supplicant. But there’s always a ping-pong table of negotiations.